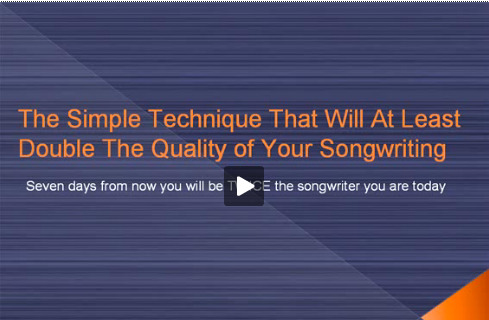 This is the third part of this online songwriting resources article series. To view part one, click here. And to view part 2, click here. The third song writing resource that I want to share with you is a free recording program called Audacity. One of the greatest technological improvements that’s really helped the song writing process is the ability to record really easily and cheaply. The reason this is so important is because one of the things that can really block you from being at your most creative and writing your best material is when you’re trying to create something and judge it at the same time. For example if you’re creating ideas on the guitar and also trying to determine whether they're any good or not, it will actually block your ability to be at your most creative. One of the easiest ways to completely eliminate this problem is to get a simple recording program like Audacity. And when you have a creative session, hit record and create in a really non-judgmental manner. With it recording in the background, you don’t even need to think about whether the idea you’re playing is worth remembering or not because you can just create freely for 20 to 30 minutes and then come back to the recording after. Also, when you listen back to the recording you’re going to hear a lot more than what you would hear than if you were trying to listen to as you were creating. You really hear the potential in your ideas much easier by listening back to the recording after the actual creative session. Audacity is a really easy way to implement this. You can just go to the website and download the program. It works on a PC and a MAC and you can just install it onto your computer and get a really cheap microphone. And then next time you want to create some instrumental ideas or vocal melodies all you need to do is open up the program, hit record and then away you go. ... but for the purposes of just recording a creative session the quality isn’t really the most important thing. The important thing is the ability to have a really easy way to record everything that you create. Finally if you're looking for online songwriting resources to explode your ability as a songwriter, be sure to check out The Songwriting Genius Within You.